The Howland dynasty began after the War of 1812, when a young Tennessee solider fighting for Andrew Jackson settled in Alabama. Over the next century, the Howlands accumulated a fortune, fought for Secession, helped rebuild the South, and established themselves as one of the most respected families in the state. But that history means little to Abigail Howland. Though she inherited the Howland manse, her fortunes reverse when her family’s mixed-race heritage comes to light and her community—locked in the prejudices of the 1960s—turns its back on her. Faced with such deep-seated prejudice, Abigail is pushed to defend her family at all costs. Winner of the 1965 Pulitzer Prize for fiction, The Keepers of the House is an unforgettable story of family, tradition, and racial injustice set against a richly drawn backdrop of the American South. Sometimes you come across a book that reminds you why you love your favorite genre. From me, the genre is literary fiction and for me The Keepers of The House is one of those books that reminds me why I am a literary fiction reader. The synopsis of the book is a little misleading. Yes, it is a story of family and tradition but the racial injustice angle is not a major issue. It's more like a reflection of the time and location. This novel spans two generation of the Howland family and their history after they settled in Alabama. The synopsis makes it seem that Abigail and the Howlands are mixed-race. They are not all of the Howlands (including Abigail) are white, there is small a branch of the family that is mixed race and their role in the story is not prominent until the end. The Keeper of The House starts off the the narrator, Abigail, reflecting on how her and her children ended up where they are. To fully understand the Howland family and the county the helped found. She takes the readers on a journey through her colorful and rich family history. A large portion of the story focuses on her grandfather, William Howland, and how he came to father three children by his mistress, Margaret who is black. The second part of the story is Abigail telling the reader about how her grandfather's past ends up effecting her present and the future of herself, her marriage and her children. Grau picked the prefect narrator in Abigail. Her voice was authentic. It was interesting to see how she developed as a person as the time pasted. I just can't say enough about her. I just really liked her and wanted to see how she got to the place in her life she was in when she was introduced in the first chapter. All the characters (good and bad) were well thought out and presented. Now of them were flat. They all had good qualities and bad. William, the grandfather was quite the character. He was mostly a serious man but at times he displayed a great sense of humor. She wasn't bad he thought. It wasn't her fault that she was fat and old and a little dull... Like me, he thought, just like me. There were some aspects in William's character that bugged me. Primary his low opinion of the women in his family. He seemed to think that they were worthless, unable to do anything without him or a man. Which is probably why he was attracted to Margaret, who he thought of as strong. This may play into racial stereotypes that still exist today. The strong black women. The women who needs a husband to survive. In reality, William's opinion of the women in his family is what kept them down. There is a part in the book where Abigail says several times, "I never knew, my grandfather never told me" or something similar. If he would have told her, maybe opened up to her, maybe things would have been a little different. 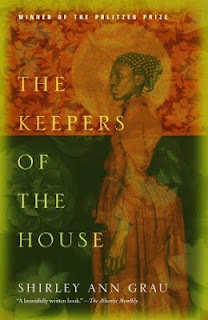 The Keepers of The House reminded me a lot of John Steinbeck's East of Eden (which I loved). The difference being that The Keeper of The House is a much smaller book, without all the details that Steinbeck's East of Eden had. But they were both tales of family history, how the started, and how they developed. This is a must read for people that enjoy literary and/or historical fiction. I can't say enough good things about The Keepers of The House. I will caution that while it is only 300 pages, it is dense and takes a while to read. I love historical fiction and the setting and time for this one are just my thing. I see that it was first published some time ago, yet I was not too familiar with the book. Thank you for your great review. I will definitely give this one a try.